Inscribed Courtesy of J.H. Cranston, Esq. Among the Jesuits who began the mission to the Hurons was Jean de Brebeuf. His first visit to them was made in 1626. For three years he lived among them, learning their language and winning their confidence. 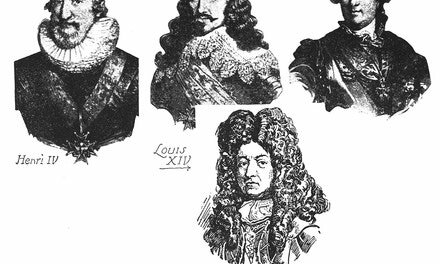 Then he was called back to Quebec, and was carried off by the English with the other French prisoners. By 1634 he was once more in the Huron country. Thenceforth his life was devoted to the mission. For this hard life he was admirably fitted. He was of huge stature, and of great strength, and could endure the fatigues and privations of rough travel and scanty fare. He had been a soldier in his youth, and could make himself at home in the camp or the Indian lodge. But the brave soldier was also a mystic, he had heavenly visions, in which he saw the cross that was the sign of the martyrdom that years later he won. The mission grew, and many other Jesuit fathers shared the work. Small wooden chapels were built in some of the villages, with resident priests in charge. A central station was established at Ste. Marie, on the River Wye, near the present town of Midland. Here, in 1639, a stone fort was built, with a chapel, a hospital, and houses for the missionaries and workmen. There were fields of grain, fowls, pigs, and even cattle, brought with incredible toil up the Ottawa. The future seemed promising, but disaster was at hand. Between the Hurons and their kinsmen, the Iroquois, existed a deadly enmity. The Iroquois, better armed and better organized, not only infested the Ottawa route to Quebec, and the outskirts of Huronia, but penetrated to the heart of the country. Raid after raid was made, and in 1648, the first Jesuit, Father Daniel, was killed in the destruction of the village of St. Joseph, near Lake Simcoe. The heaviest blow fell the next year. Early in the morning of the 17th of March, a war party of twelve hundred Iroquois unperceived burst upon the village of St. Ignace, about seven miles from Ste. Marie. Its defenders were slain and the village burned. The Iroquois rushed on to the next village, St. Louis. Here were living Father Brebeuf and his assistant missionary, Father Gabriel Lalemant, who had reached Huronia only the year before. 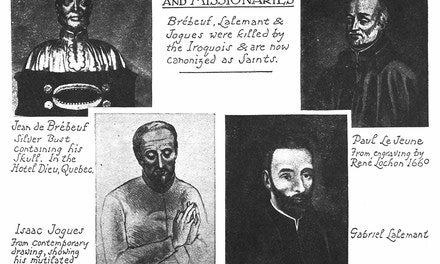 Lalemant was physically a striking contrast to Brebeuf; of frail and delicate constitution, he had long been denied by his superiors his intense desire to go out as a missionary to Canada. But his spirit was as resolute as that of his more robust companion. Both refused to desert their Indian flock, though the Hurons begged them to flee to Ste. Marie. They remained in the midst of the fighting to give the last rites of the Church to their wounded and dying converts. The Hurons, numbering only about eighty warriors, fought valiantly, but the Iroquois soon made their way within the defences and captured the survivors, including the two missionaries. They were led back to St. Ignace and put to the dreadful tortures which the Iroquois inflicted upon their prisoners. 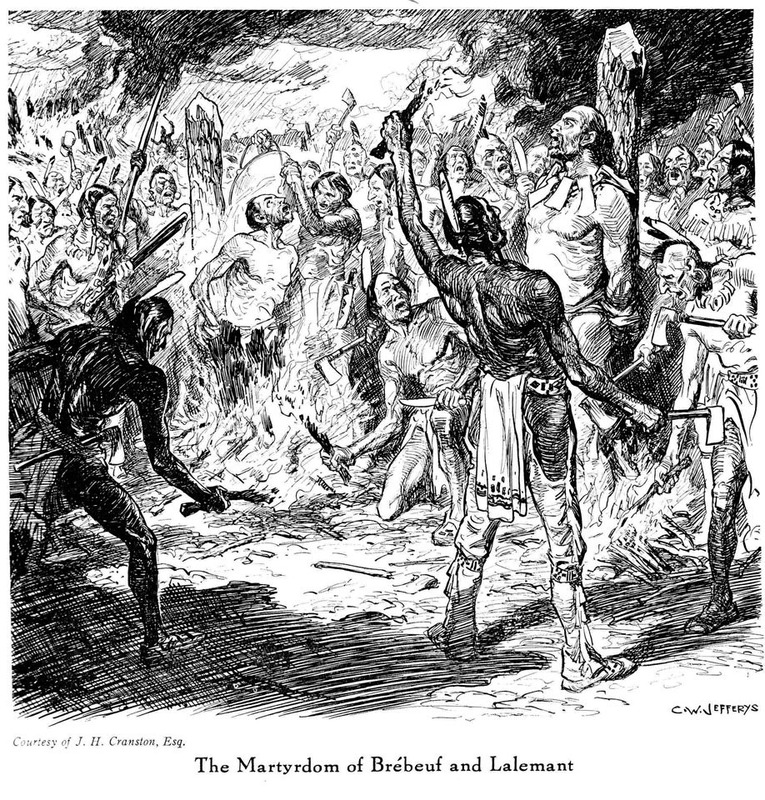 Brebeuf suffered for four hours, when a chief cut out his heart and ended his agony. Lalemant, in spite of his frail physique, remained alive for fourteen hours before he, too, was released by death. The Huron nation was scattered as a result of this ceaseless warfare, and a feeble remnant sought shelter in the neighbourhood of Quebec, where today, in the village of Lorette, their descendants, now largely French in blood, still live. Drury, E.C. All for a beaver hat: a history of early Simcoe County. County of Simcoe, 1972. 100 p. Illus. Bowman, Bob. Dateline: Canada. Toronto, Holt, Rinehart and Winston, 1973. n.p. Illus. Colombo, John Robert. Canadian literary landmarks. Willowdale, Ont., Hounslow Press, 1984. 318 p. Illus.